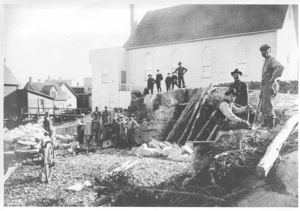 This old photograph shows the beginning of construction of the North Bay Methodist Church, now Trinity United. Courtesy of Kevin Reeves. Researching the history of North Bay has its challenges. There are no city archives and most public documents from the city, the school boards, and the registry office are still held by those bodies and have not been deposited with the Archives of Ontario. This makes access more difficult as the main mandate of these bodies is to deal with current issues, not historical ones. The city disposed of most, if not all, the historical documents it was not legally required to keep. It therefore has council minutes, bylaws and assessment rolls. The bylaws are online but the earlier ones are not indexed. Discovery North Bay has an important collection of material but there is no online catalogue to date. The Dionne Quint Museum has the Fred Davis collection of images and a collection of scrapbooks but most of its collection consists of actual artifacts and printed sources. A major collection of Orange Order material is available at Nipissing University. Indexes to the census, cemetary records and many other useful sources can be found at the library of the Nipissing Branch of the Ontario Genealogical Society housed in the Public Library. The Archives of Ontario does have some material relating to North Bay, usually in a series created for other purposes such as the theatre files, educational material, or material relating to licensed premises. There is a good online search engine. Some of the collections at the Laurentian University Archives and the Centre de recherche en civilisation canadienne-française in Ottawa also have records relating to North Bay. There are many private collections of material which can sometimes be accessed. The most important are those belonging to North Bay’s oldest churches, Pro-Cathedral, Trinity, St Andrew’s and St John the Divine. Fraternal groups, service clubs and other social organizations also often have material but there is no central listing of who to contact. Some family collections are also important. This entry was posted in Community History, Documents and tagged archives, North Bay, research on January 22, 2013 by Françoise Noël.